My sixth ground of 2015 was on Monday 6th April at Parsonage Field in Farleigh, Surrey. 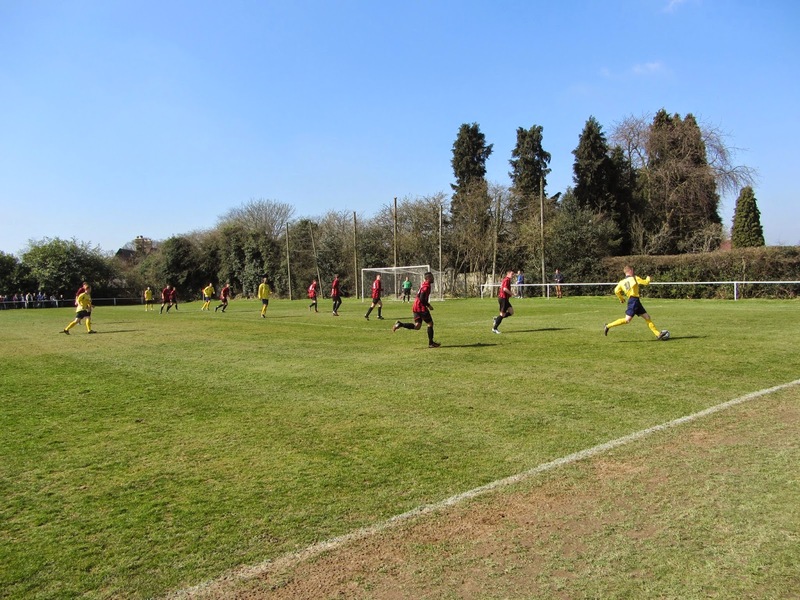 The match was Farleigh Rovers vs. AFC Croydon Athletic in the Combined Counties League Division One. Parsonage Field is in a leafy, residential area on the edge of Warmlingham. The ground is around 3 miles east of the closest railway stations at Whyteleafe, Whyteleafe South and Upper Warlingham. The venue became home to the club in 1959. The southern side of the ground contains the car park, a clubhouse and the dugouts. The clubhouse building has an overhanging roof providing a covered spectator area which includes a couple of wooden benches. To the right of this there is an open area which extends towards the pitch and this contains several additional picnic benches. The remainder of the venue is uncovered standing but there are no more hard standing areas on the other three sides. There is a metal barrier running alongside the pitch on the the northern side of the ground and this extends round the corners almost as far as the two goals. There is however only a narrow strip where fans can congregate behind the two goals. Directly behind the eastern goal is the access road to the venue and beyond this a field. The perimeter fence on this side has seen better days so the club are hoping to replace this soon. 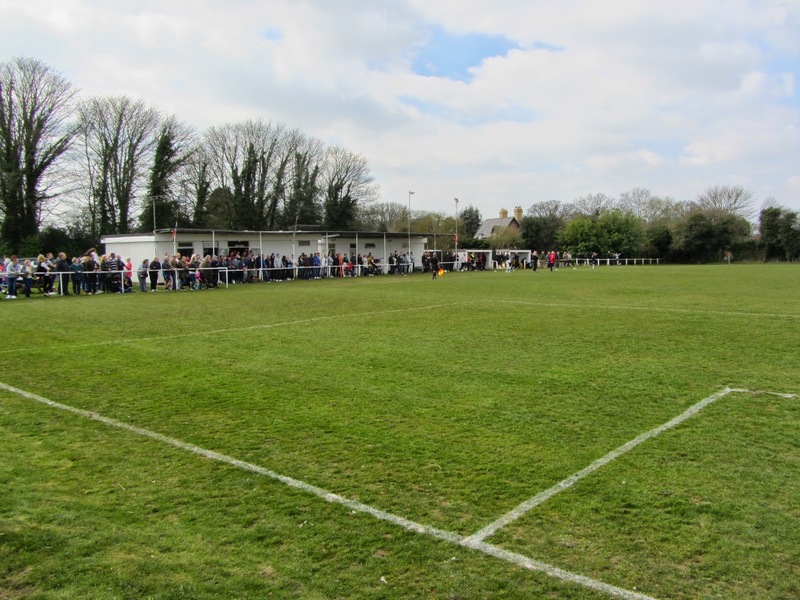 There are no floodlights at Parsonage Field which led to the club moving to the Croydon Arena a few years ago. They have now returned but will be unable to progress any further up the league ladder without a floodlit ground. This was a top of the table clash with both sides knowing a win would see them occupying 1st place come the final whistle. The visitors had the best of the opening period of the game and took the lead in the 26th minute when Callum Maclean controlled the ball well in the box before driving into the bottom corner. AFC Croydon Athletic were looking to extend their lead while they were on top but two Farleigh goals in the space of four minutes turned the game on its head. Just after the half-hour mark the hosts were awarded a penalty when a free-kick was handled in the box - Liam Neaves stepped up and sent the keeper the wrong way to level the game up at 1-1. In the 38th minute Neaves scored again when his free-kick into the area bypassed everyone and bounced into the top corner of the net. The away side were on top for the bulk of the second half but Farleigh dug in resolutely and were able to eke out a 2-1 victory to remain at the summit of the division.